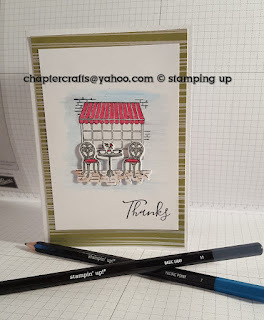 Hello and welcome to another project using the charming café bundle from stampin up! spring summer. I just love this bundle. Whisper White card stock 8 1\4" x 5 7\8"
Sweet soiree designer series paper 3 \78" x 5 5\8"
Labels: Spring summer catalogue. Charming café thank you card.